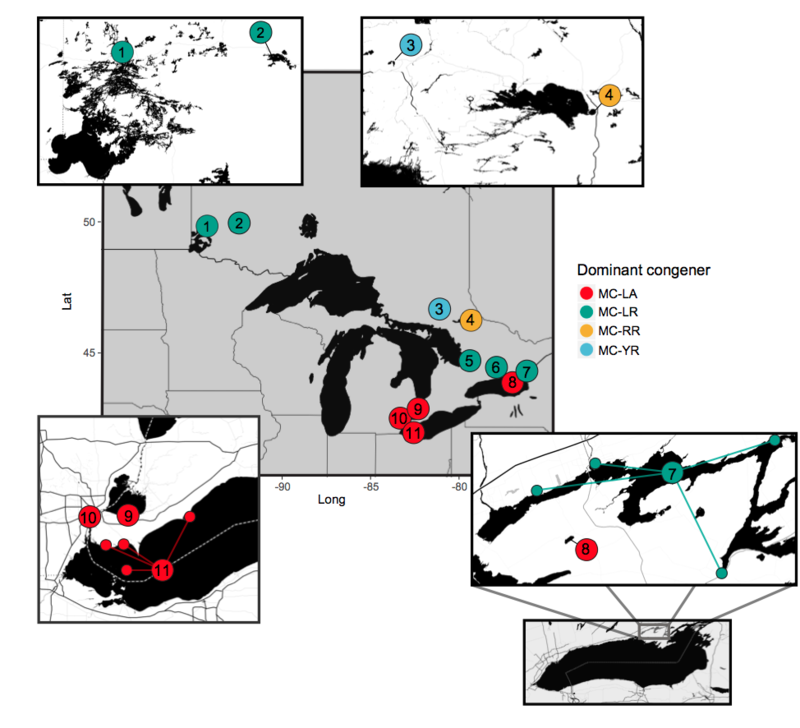 For my current PDF work at University of Ottawa (F Pick) and Western University (I Creed), I am examining how environmental factors influence the expression of different microcystin congeners in freshwater ecosystems. Cyanobacterial blooms increasingly impair freshwater lakes, with the potential for a parallel increase in neuro- and hepatotoxins produced by these organisms. This is problematic given that wildlife, livestock and even human fatalities have been linked to cyanotoxin exposure. With respect to the microcystins, little is known about the occurrence of specific congeners in the environment, yet these vary widely in their persistence, mammalian toxicity and potential bioamplification up the food chain. To examine the occurrence of different congeners in response to environmental change, we conducted a regional study to identify the climatic and nutrient optima of the most commonly expressed microcystin strains. We show that the more commonly studied microcystin-LR dominated under calm, warm and nutrient rich conditions, whereas the more recently identified and increasingly common microcystin-LA was associated with relatively windier, wetter, and nutrient poor conditions. We complemented this study with a synthesis of congener occurrence to examine the variability of microcystin occurrence across the globe. We detected large differences with respect to which congener was most often reported or detected between North America and Europe. The environment-congener associations likely vary among regions and more work is needed to identify whether the ecological niches of congeners are constrained. Ultimately, the environmental fate of the different microcystin strains will likely affect the degree of cyanotoxin bioamplification in aquatic ecosystems. Scientists, governments and non-governmental organizations are increasingly moving towards the collection of large, open-access data. In aquatic sciences, this effort is expanding the scope of questions that can be performed to further our knowledge of the global drivers of water quality. Cyanotoxin concentration is one variable that has received considerable attention, and although strong local-scale models have been described in the literature, modelling cyanotoxin concentrations across broader spatial scales has been more difficult. Commonly used statistical frameworks have not fully captured the complex response of toxic algal blooms to global change, limiting our ability to predict and mitigate the impairment of freshwaters by toxic algae. Here, we advance our understanding of drivers of cyanotoxins by applying a hierarchical “hurdle” model.​ In particular, we tested the importance of multi-scale interactions among environmental features in driving microcystin concentrations above the limit of detection. We then used boosted regression trees [BRTs] to identify environmental thresholds associated with severe impairment by microcystins. Accounting for numerous non-detections, spatial heterogeneity and cross-scale interactions substantially improved continental-scale predictions of bloom toxicity. Our model accounted for 55% of the variance in the probability of detecting microcystins across the United States, and 26% of the variability in microcystin concentrations once detected. BRTs further showed that although both local and regional drivers were associated with microcystin concentrations at low to intermediate provisional guidelines, only local drivers came into play when predicting higher limits. Identifying the interaction between local and regional processes is key to understanding the heterogeneous responses of microcystins to environmental change. Past studies have shown that diffuse nutrient loading from agricultural activities is an important cause of lake eutrophication. The degree to which this relationship can be scaled-up (e.g. at an inter-regional scale) has not, however, been widely addressed. My thesis objectives were therefore to define the generality and the impact of agriculture land use and lake morphometry on lake water quality. We tested whether agricultural activities explain a significant proportion of the variation in lake water quality at a broad inter-regional scale. The degree to which lake mean depth modulates this response was also assessed. From our meta-analyses of 358 lakes, we noted a significant correlation between total phosphorus concentration and the extent of agricultural catchment development. This relationship was further strengthened by including lake mean depth as a second predictor. We also observed among-study variability in the relationship between these three variables. Thus, although there is a general relationship between total phosphorus concentrations and our two predictors, agriculture catchment development and lake mean depth, regional baseline nutrient differences modify this relationship. To address the issue of lake morphometry more closely, we adopted a spatio-temporal approach to investigate whether the effect of agricultural catchment development on water quality differed between dimictic and polymictic Albertan lakes. We found that the correlation between surface water total phosphorus concentration and the percent of agriculture in a lake’s catchment was strongly modified by lake mixis patterns (which in turn are related to morphometry). Furthermore, with our paleo-indicators of lake water-quality, the chironomid communities, we detected opposing responses between the dimictic and polymictic basins to temporal land-use change. We suggest that external nutrient loading exerts a more notable effect on dimictic lakes, whereas internal loading is more important in polymictic systems.